After two years, I finally found a bottle of one of my favorite Italian wines: Sangue di Giuda! I first drank this sweet red at a little gelato shop about a week after I moved here. Each time I went back I always ordered at least one glass, but for the life of me I could never remember the name long enough to track down a whole bottle. I finally found the bottle and I was pleasantly surprised that this is a very affordable wine, it only cost me about $6. They were charging 2.50 euro (almost $4) a glass at the gelato shop, so I think that is the last time I will be drinking there! Sangue di Giuda (literally, Blood of Judas) is a sweet, mild red with a little bit of fizz (called frizzante). The low alcohol content means you can drink it in the middle of the afternoon and not worry about making bad decisions by dinner time. I went hunting around google for some good info to give you about this wine, and what I found is that not many people drink Sangue di Giuda (maybe it has something to do with the name), or at least they don’t write much about it. Apparently, the legend is that the name came from friars who disapproved of the supposedly aphrodisiac effects of the wine. Before I move on I have to rant a little here: the article describes the wine as encouraging “quaffing”. I cannot even begin to describe to you how much I hate the word quaff and all of its ugly little cousins (quaffing, quaffable, etc). Just say it is very drinkable!! Which it is. Anyway, the wine is made near Mlian in the Oltrepo Pavese wine zone of the Lombardy wine region, with grapes like Croatina, which means “little Croatian girl”. I drank my Sangue di Giuda chilled with dinner outside and it was wonderful, but I can also see how this wine would be a good dessert wine paired with some fruit (or gelato). If anyone sees a bottle of this in the states please let me know where and how much, I am very interested to see if there is a huge markup because it is not well known. 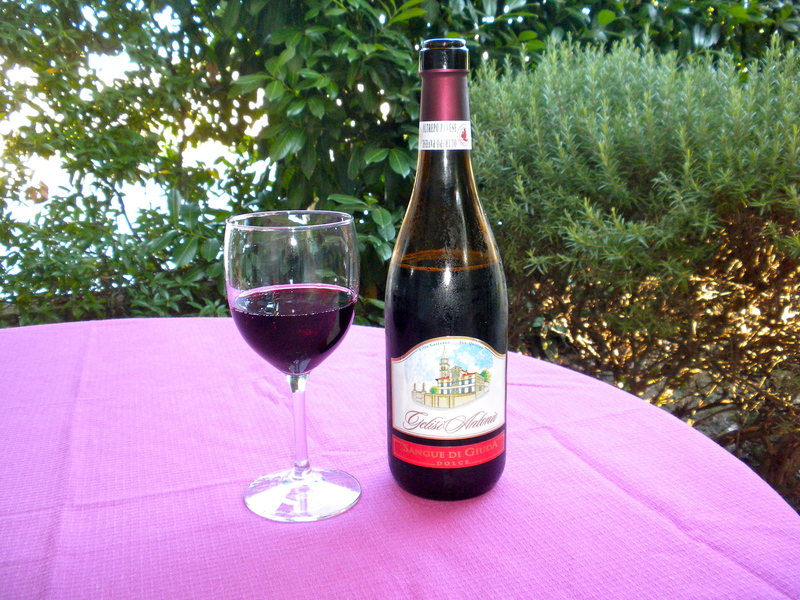 This entry was posted in Uncategorized and tagged Food, Italy, Wine. Bookmark the permalink. I just experienced this wine and I love it. It is truly refreshing and awesome flavor. The name isn’t the greatest but the taste helps overcome that. I purchased a bottle for 14.99. Please keep me posted of anymore wines of this caliber. Hi Marcus! Did you find the wine in the states? I am hearing that it is hard to find in America. I know they have it at Spec’s in Texas. The same exact wine in your picture at the top! I went to the Wine Room located in Winter Park, FL off of Park Ave… During a wine tasting I fell in love. They sell it for $19.99 plus tax…. I love it! I bought a bottle at Bev Mo is So Cal. Around $15. Had no idea it was sweet and fizzante, but it is delicious! I found it at one of the Air Force bases in San Antonio Texas……. I have been drinking the Montebello brand, with pink labeling, of Sangue. I absolutely love it. It’s around $16 a bottle at the Villiage Wine Shop in Lakeland, FL. Yes, the pink label!! They have it a shop here in Fort Lauderdale, FL… It was there I fell in love with this wine!! That’s awesome! I can’t believe I never heard of it until I moved here!!! Like Justin said, they are in the Spec’s in Texas. I went in looking for a bottle of Stella Rosa. They were sold out, but recommended Sangue de Giuda. I’ve been able to get it easily at two Spec’s stores in Austin so far. Thats awesome! Do they have Torcolato at Spec’s? There’s a guy at a mall here in Charlotte, NC who sells it for 21 bux a bottle. The brand is Cantina di Casteggio. Glad I found this site. I’m going to see if I can order a case for much cheaper. $21 a bottle is crazy!! I will let you know if I hear of any places to get it cheaper in the states. It is so disappointing that it is not available more places, I think it would be a big seller! There is a store called Bevmo they sale the brand Cantina di Casteggio (Sangue de Giuda) for only $14.99,you buy one bottle get the second one for 5 cents..sounds crazy I know but its a great deal but I absolutly love this wine its a good sweet red wine, good for dessert as well it best when chilled. By far the best brand of Sangue di Giuda I have purchased. Bought it at BevMo in CA for $10 or $12 a bottle. However, they have a 5 cent sale from time to time and your second bottle is 5 cents. I just bought a bottle at Food Lion in Greensboro, NC. It was part of a cart marked “Reduced for Quick Sale” so I’m not sure of it’s original price, but the marked down price was $9.44. I also got a bottle of Red Guitar Old Vine for $6.99 which I don’t believe is a huge mark down from it’s original price if that helps any. It sounds like it is finally making the rounds in the states! How was the Red Guitar Old Vine? Ciao! I live in Italy and drink Sangue di Giuda regularly. It’s available at the markets by my house for 2-4 euro per bottle (of different types). The bottle pictured above is a type that’s commonly imported to the states (especially AF bases) by Dolce Imports. Hi Jared! Do you remember any of the other brands of Sangue di Giuda? I would love to find as many as possible for a good sampling! I picked up a few bottles in Italy last month. Got a 2011 made by Cantine Francesco Montagna and a 2012 made by La Versa. I can tell you from experience, you’ll find more producers the closer you get to Pavia (lived there many moons ago). I just purchased a bottle of this wine (the one with the pink label) in downtown St. Augustine, FL at a little shop called The Gifted Cork. I don’t remember how much it was, but it is definitely my new favorite wine! Hi Kelley! I heard through the grapevine that St. Augustine has some great local wines, have you tried any? Any suggestions? The “Wine Cellar” in Mt Dora, FL sells it too. It’s my favorite as well! Yeah, Mt Dora has caught on after we requested it for about a year. Now it is at Maggie’s Attic as well at $20 a bottle. Would love to find where I can buy it by the case for $10 a bottle. I have seen both a pink label and the red label “Giorgi”. Please let us know if anyone see’s any great local deals. Thanks! Hopefully, this can help you out. I too am a fan. I found this wine at Cork and Olive in Brandon, FL. Cork and Olive in Altamonte Springs, FL carries it as well. $19 a bottle. The best! Found this same bottle at Four Winds International Food Market in Pensacola, FL. I just picked up this exact same bottle at AAFES (the military exchange) here in Korea. Very thoroughly this wine! Besides Sangue I also love brachetto d’acqui ! The ABC liquor stores in Florida carry it. Serving it up at our new years on the 5 course with pairings in Senoia Georgia. This wine shop in st Augustine fl sells it for around $14. I live in jax and got down to st aug. just bought some a month ago. Yeah they have the Dacastello Sangue di Giuda now with a black label and confetti which is outstanding! I live in Houston and was at my local Spec’s picking up a bottle of Stella Rosa when one of the employees told me to try this wine. I love it! Hi. It’s availability it’s certain at a retail wine store in NYC. La vid wine and Spirits . 315 6 th Ave 10014 and its awesome wine that I think people should taste. I’m promoting it trying to get people to know what it is. Hope this will help you. BTW the producer is Vanzini. I love this wine too…………….but it’s hard to find, even in NYC area. we had some last night. I usually drink a nice Lambrusco (Lini is good) when I can’t find this wine. Its been 3 yrs since I drank this wine. Found it today, bought 4 bottles at 14.99. In Augusta, GA.
Hi! Can you please tell me where in Augusta you found Sangue Di Guida? Erica, I found your article refreshing and the comments comical. This is my wife’s new favorite. We actually just moved to Italy and visited the vineyard and winery that produces this Sangue Di Giuda, Gelisi Antonio. Gelisi Antonio, if I remember correctly, was the founder of this family owned winery. The winery is just a few miles from Aviano AB. I hear they do export quite a bit to AAFES, hence people finding them at Air Force Bases. They produce 12 or 13 different wines, all but one are 3.50 Euro each. I’m guessing the cheapest place you’re going to find it, besides the winery itself, is any Class Six AAFES store on a US Air Force installation. Oh my gosh! I am going to have to visit the winery! Did you find any other wines at the winery that you liked? Any suggestions? Found it at the Farm Fresh in Hampton, Virginia. I paid about $11.99 for the last bottle on the shelf. My Aunt that doesn’t even drink wine recommended it. Just bought this wine today at a local Dave’s supermarket in a suburb of Cleveland, oh for $10.49 and it is delicious. I think I’ve found my new favorite wine to have a small glass each evening. I’ve discovered this wine at shop in Clifton Park, NY. It sells for (with tax) about $8.00. It’s a very beautiful and inexpensive wine. Great at night, with crackers and cheese. I just tried this last night and LOVED it. My hosts in San Antonio TX say that they bought it at a local Whole Foods supermarket (wine department). Wine chateau in Metuchen, nj sells this wine. Went yesterday and they were giving out free samples. Are you supposed to serve this wine cold or room temperature? Is this wine supposed to be served cold or room temperature? This is my new favorite wine. I found it at a hole-in-the-wall liquor shop just south of Cincinnati for $11.99. I first tried a bottle of (Ca’ Bea) Sangue di Guida in a little winery in Washington, Va. The BEST bottle of red wine I’ve ever tasted…EVER. Since I live closer to Washington, DC I searched for something closer to home and only found it in one place – Potomac Wines in Georgetown (www.potomacwines.com). It is $9.99/per bottle which is a steal compared to the $17.99 at the winery. Did I say it was the best red wine ever!?! 🙂 As good as it is, I’m surprised that it is so hard to find. I discovered this wine this past year. It has since become one of my favorites! There are only 3 places that sell it in San Antonio and 2 of them are on bases. The one where I discovered it at was a little liquor store near my old apartment. It cost $7.99 a bottle. Not bad at all! WOW!!! I am stunned at some of the prices! I only pay $10 for a bottle. Love this wine. It’s really the only red my head can tolerate as most reds give me a headache. I realize this post is old but we can get this wine for $8.49 a bottle at BevMo in Concord, CA. I had a chance to experience this great wine on recommendation from Once Upon A Vine in RIchmond Virginia at 12.99 a bottle it was reasonable to me. You are right a slight fizzy taste combined with the sweetness is excellent. I had this bought for me a couple of years ago,can you buy it in England. I stumbled upon this wine last Friday while looking for a good Christmas wine. Love it! I stopped in and bought 2 more bottles today. The store clerk told me she keeps it in stock at the request of an Italian customer. I also just discovered this wine! Was in one of the wine shops in mt dora, fl and told the girl I wanted something sweet and she pulled out the sangue di Giuda and I fell in love. Im not big on reds but this one is awesome. I paid $9.00 for one glass, I seen on a comment that it may be sold at abc liquor im going to try there if not The Wine Room in Winter Park, fl sells it on their website for $18.99. Cheapest ive seen it online other then one had it for $15.99 but shipping and handling will be outrageous. If anyone else knows of anywhere closer to me in central fl or a better website id appreciate it! And thanks Erica, I haven’t been able to find any information on this anywhere then when I googled it your page came up lol. Never would of found out this much info without it.